When it comes to the Universe, things often go bump in the night. But whether two galaxies collide, a star explodes in a brilliant supernova, or a meteor hits a massive planet, we tend to catch the aftermath tens to hundreds of thousands of years later. Of course, there’s always an exception to the rule. In today’s news, astronomers using NASA’s Mars Reconnaissance Orbiter have found a fresh meteor-impact crater. And it’s the biggest seen using before-and-after pictures. When it comes to the red planet, we’ve seen evidence of fresh craters before, but usually the impact can’t be nailed down to better than a few years’ time. The constant sweep of the obiter’s weather-monitoring camera, the Mars Color Imager (MARCI), however, allowed us to pinpoint the impact to within a day. The orbiter began its systematic observation of Mars in 2006. Ever since, Bruce Cantor, MARCI’s principle investigator, has examined the camera’s daily images, searching for evidence of dust storms and other observable weather events. Cantor’s findings help NASA operators plan for weather events that may be harmful to the solar-powered rover, Opportunity. So Cantor dug through earlier images, discovering that the dark spot wasn’t visible on March 27, 2012, but appeared on March 28, 2012. MARCI is a low resolution camera, which is what allows it to see a large area of Mars constantly. But without a high resolution image, we can’t pick out the details of the impact-like black smudge. So Cantor performed follow-up observations with the orbiter’s telescope Context Camera (CTX) and the High Resolution Imaging Science Experiment (HiRISE). 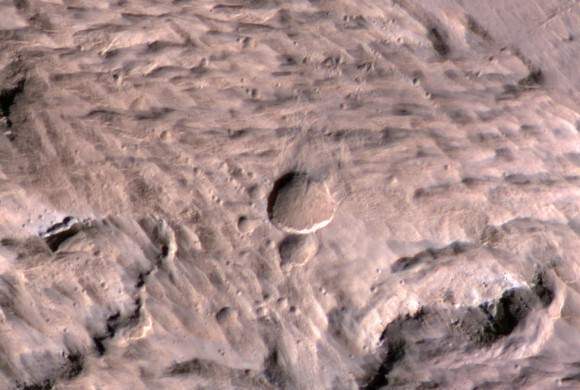 CTX has imaged nearly the entire surface of Mars at least once during the orbiter’s seven-plus years of observations. It photographed the site of the newly-discovered crater in January 2012, revealing nothing prior to the impact. But two new craters appear in the recent image. The largest crater is slightly elongated and spans 48.5 by 43.5 meters, roughly half the length of a football field. “The biggest crater is unusual, quite shallow compared to other fresh craters we have observed,” said HiRISE Principal Investigator Alfred McEwen of the University of Arizona, Tucson. The impacting object is likely a few meters across. Something that small would burn up in the Earth’s atmosphere, but with a much thinner atmosphere (about 1% as thick as Earth’s), Mars lets most debris right on through. To add to the details, images from HiRISE revealed more than a dozen smaller craters near the two larger ones seen by CTX. It’s likely that Mars’ atmosphere, as thin as it is, supplied enough pressure to break the incoming meteoroid into smaller pieces, leaving multiple impacts behind. The initial NASA press release can be viewed here. Looks like nice ejected “boulder ” tracks at top right and top right corner. Wow…. imagine meteor prospecting on Mars? The windswept deserts there appear very similar to the dry Antarctic valleys where so many meteors have been found. Meteor harvesting on Mars might even become the first profitable industry? Imagine collecting nearly pure NiFe meteor nuggets for manufacturing purposes. The NiFe meteors might be located using low flying balloon borne magnetometers? But what other elements have we found on Mars that might be extracted and useful? Foamed metals? Can we set up enough solar electric power to melt those NiFe meteors or extract aluminum from the clay deposits we’ve found?